CNN is reporting that Donald Trump’s first executive action will be to withdraw from the Trans-Pacific Partnership (TPP) agreement. 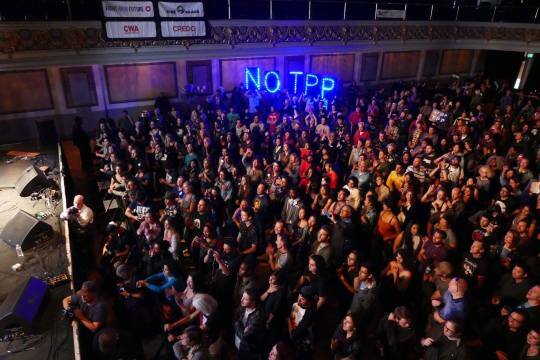 It’s important for the public to understand the context of how the TPP was defeated. By the time the deal came up for a vote in Congress late last year, all the leading Presidential candidates opposed it, due to widespread opposition from across the political spectrum, sparked by a grassroots, years-long, international movement. This piece in The Guardian chronicles some of that history. “The victory against the TPP belongs to the people, not to Donald Trump or any other politician. An unprecedented international movement of people and organizations from across the political spectrum came together, and lead nothing short of an uprising that stopped an outright corporate takeover of our democratic process. Together we sounded the alarm, and made the TPP so politically toxic that no presidential candidate who wanted to be elected could support it. The TPP would have lead to widespread Internet censorship, undermined human rights, and devastated our economy and the planet. Corporations attempted to turn the deal into a wishlist for policies they knew they could not pass through a more transparent process. But an unlikely band of labor unions and tech companies, environmentalists, hackers, and Tea Party patriots took on the world’s largest and most powerful corporations, and we won.